9. Easy Internet key as shortcut to your E-world.ck 1 , Track 2 , Track 3-option. The condense, industrial sized easy touch keyboard includes a built-in Glidepoint Touchpad and it has a compact 1U design for standard industrial applications. This Industrial keyboards are designed according to EIA-RS-310C specification. It can be mounted to a drawer or to the Rackmount Drawer or have the combined Keyboard and drawer which is the ACK-730PB-MRP in Black color. 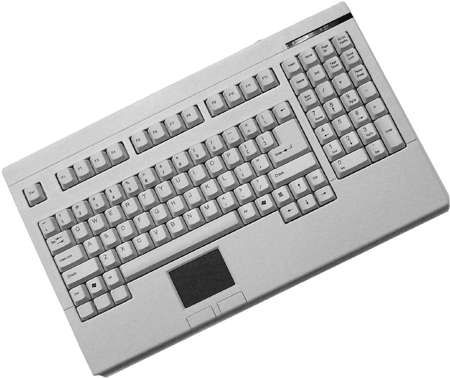 This PC keyboards offers a flexible selection of full-size keyboards to meet any industrial environment requirements.